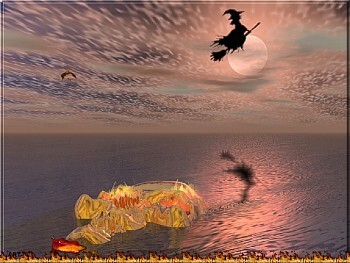 A background of a witch flying past the moon, with animations and music, by Rob Zombie, "Dragula". Bats and burning fire enhance this saver to cast magic spells. Happy Halloween! Optional music. Download Free Wallpaper from this screensaver! Images and Screensaver copyright, ART-TLC ©. Best viewed with 1024x768 screen settings.